Max�s Classics, LLC, is a dealer of investment quality cars and trucks. 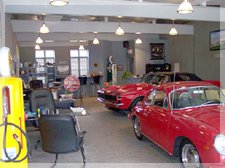 We believe that you should have the best when it comes to a collectible automobile. With today�s financial market, when you invest in a true classic car or truck, you put your money into a successful and fun venture. Our mission is to take care of each and every customer with professional, courteous, and exceptional service. All of us here want to make your buying experience a pleasant one. Our knowledgeable staff is available to answer any questions that you may have on all of our cars. We are happy to be of assistance. Each vehicle is thoroughly gone over by our own mechanical technician. We want you to be confident that you are buying a safe and reliable collectible car or truck. The quality of vehicles that we sell, are unsurpassed. From muscle cars to hot rods, and everything in between, we have it. If there is a special car or truck that you are looking for and we do not have, we can help you find it. Come visit our showroom and find the vehicle of your dreams. Whether it�s was your first Chevelle in high school, or the car you bought when you graduated college, you can recapture that feeling. We can help make your dream a reality.